As a former adolescent male, I spent a lot of my non-masturbating teenage years reading Mad magazine. In fact, I think I first learned what the Watergate scandal was from Mad. So when Mad offered us a chance to have an exclusive preview of their next issue's hybrid car ad parody, I leapt at it. There's a lot more CG work in here than I ever remembered in a Mad, but that's just how life is now: we can have realistic looking reflections on our hypothetical ironic panda-skin upholstered fake hybrid cars. That's one step closer to the Singularity or something, I think. 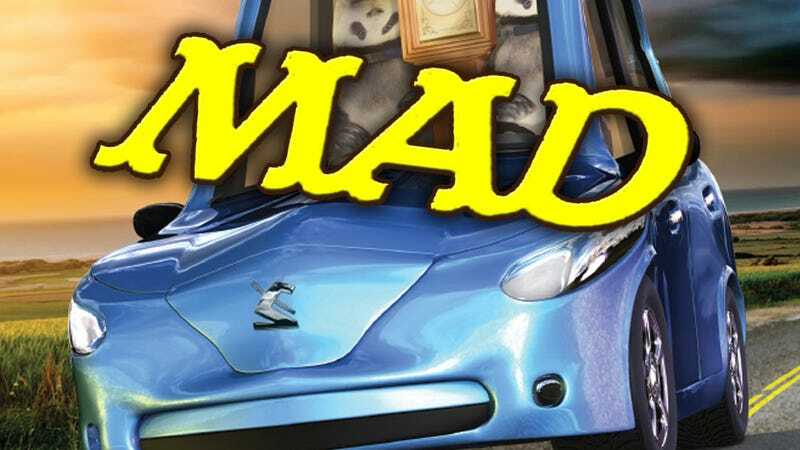 More importantly, I'm delighted to see Mad performing the much-needed service of helping young gearheads develop their perverse senses of humor and build up the necessary levels of ironic detachment needed to thrive in modern society. Also, I'm not so sure a car grandfather clock's such a bad idea. You could measure your G-forces in turns by computing how far off the time in as you whipped the pendulum all over the place.